Lees Ferry Update: Hot Weather; Hot Fishing! June has been hot both in temps and fishing! 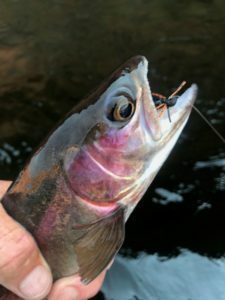 The weekend “bug flows” seems to be working well, and coupled with increased water releases during the week, fishing is really good! For fly fisherman, one word: Cicadas! The big bugs are heating up and the last 10 days have seen increased interest from the fish for these fabulously fun big dry flies! As we get closer to July the activity and interest from the fish is increasing, and many big fish are being caught. For wading fisherman, dry/dropper combos with Stimulator, Wulffs and cicadas with midge patterns below are working well. If your midge isn’t consistently hooking fish, try changing the midge pattern regularly, as it seems the fish like a little variety. When fishing a cicada pattern, limit false casts to prevent the line twisting and causing the fly to land unnaturally. Ideally, one cast should be all you need to get the fly in front of eager fish. Before coming to Lees Ferry, practice casting in your yard or local park and work on getting 40-50 feet of line where you want it using only one cast. If you practice with that goal you’ll be more likely to achieve success when on the water. Kind of like practicing on the driving range before a big golf game…. Bottom line, the better you can cast the more fish you’ll catch!